Archery was included in the Olympic schedule in 1900 at Paris but the British archers did not join the competition for the medals. They also left out the 1904 Summer Olympic Games in Saint Louis which had 5 archery events, however, no archers outside the United States participated. The British archers made their debut at the 1908 Summer Olympics which were held in London and took 5 medals in three events – 2 gold, 2 silver and 1 bronze. Archery was not included in the schedule of the 1912 Olympics but reappeared in the 1920 Antwerp Summer Olympics schedule. However, only men competed in three events and only three countries - Belgium, the Netherlands and France sent archers to compete. Archery was not returned in the Olympic schedule until 1972 but it is an Olympic sport ever since. The year 1972 is also considered as the beginning of the modern archery at the Olympics which soon came to be dominated by the South Korean and American archers. Both gold medals (men’s and women’s individual) at the unfortunate 1972 Munich Olympics was won by the United States archers, while Great Britain won none. It was not until 1988 when Steven Hallard, Richard Priestman and Leroy Watson won bronze medal for Great Britain in the men’s team in Seoul. Steven Hallard and Richard Priestman, this time with Simon Terry won Britain another bronze medal in the men’s team at the 1992 Summer Olympics in Barcelona, while Simon Terry also won bronze medal in the men’s individual. The last Olympic medal for Great Britain in archery was won by Alison Williamson who won bronze medal at the 2004 Summer Olympics in Athens in the women’s individual. With 4 bronze medals from the beginning of the modern archery at the Olympics, Great Britain is ranked 17 but with the 5 medals won at the 1908 Summer Olympics in London, it is ranked 5. With the Summer Olympics taking place in London again in 2012, the country would be delighted if the British archers could repeat the success of the archers in 1908. Simon Terry and Alison Williamson who are also a part of the Great Britain’s archery team for the 2012 Olympics have shown that they are in the very top. Despite being one of the youngest members of GB team, Mark Nesbitt is also believed to be a serious candidate for an Olympic medal in archery. He failed to advance to the quarter finals at the 2010 Summer Youth Olympics in Singapore but two gold medals from the Youth Olympic Festival Australia in 2009 clearly reveal that he is an excellent archer. The British archers, however, will be faced with a tough competition. 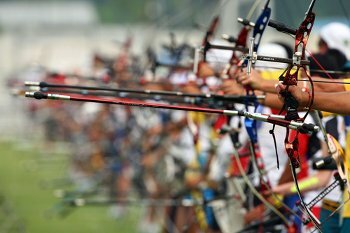 Country with most medals in both modern archery and all archery competitions at the Olympic Games is South Korea with 30 medals of which 16 are gold, 9 silver and 5 bronze. On the second place is the United States with 31 medals (including those won before 1972) but with two gold medals less than South Korea. But in addition to traditionally excellent South Korean and American archers, the GB team will also have to compete with many outstanding archers from other countries all of which are on their way to London with an aim to win an Olympic medal.